You love pets. There's nothing that can compare with the love and companionship you get from a dog, cat, or other animal. So what if there was a way you could make some money caring for other pets. Something that wouldn't require a huge time commitment or going back to school. Well, that's all possible by becoming a pet sitter. Getting into the pet sitting business isn't expensive and in addition to the benefits of spending time with animals, it can pay quite well-the average being $16 a visit. 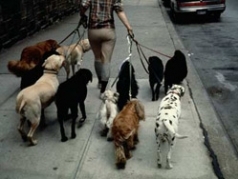 So what do you need to become a pet sitter? Your expenses will be fairly minimal. You need some reliable transportation to get you to and from your jobs, insurance, and a bond. Many insurance companies offer insurance for pet sitters to protect you in the case of a lawsuit or claim. You must have insurance! Getting a bond will help protect you and reassure your customers as well. So now that you have your essentials, there are a few other items you might want to consider, such as a couple different emergency kits. One is for your car in the event you have to transport an animal. It contains cleaning supplies so a mess doesn't become a huge clean-up ordeal. The other is for use in the customer's home. It contains a spare collar, leash, and can opener for pet food, in addition to a change of clothing, a spray bottle filled with half water and half vinegar for any aggressive dogs you might encounter on a walk, a first aid kit, flashlight, and whatever else you think might be necessary. Okay, you have your supplies. Now what? Pick a name! Something catchy. Check to be sure your name isn't trademarked or being used by several other companies in your area. You also need to decide the legal structure of your business. Is it a sole proprietorship, partnership, or limited liability company? This will determine what taxes you pay. Next, license your business. Check with your state to see what their rules and regulations are. Now you're ready to begin getting business. Talk to your local veterinarians, pet shop owners, and groomers to see if they'll allow you to leave a stack of business cards or a flyer promoting your business. Consider listing your business in the Yellow Pages or placing an ad in the local newspaper or a newsletter. With a catchy name you'll find yourself getting more and more calls. When deciding on your rates, take into account the needs of the pet you're sitting. Is it a special needs pet that needs a lot of attention? Is it simply a dog that needs to be fed a couple times a day? Offer reasonable prices and you'll see more repeat customers. The big lesson is, try to find what works and learn from your mistakes. Take advice from others. Listen to your customers. Before long your pet sitting business will be the purr-fect choice for pet owners in your community. To learn more, read Profitable Pet Sitting.